We are proud to announce a new series of works by Thomas More; and to find an edition on Amazon – simply click on the name or type the ISBN into your countries Amazon page. Utopia is a work of fiction and political philosophy by Thomas More (1478–1535) published in 1516 in Latin. The book is a frame narrative primarily depicting a fictional island society and its religious, social and political customs. Many aspects of More’s description of Utopia are reminiscent of life in monasteries. 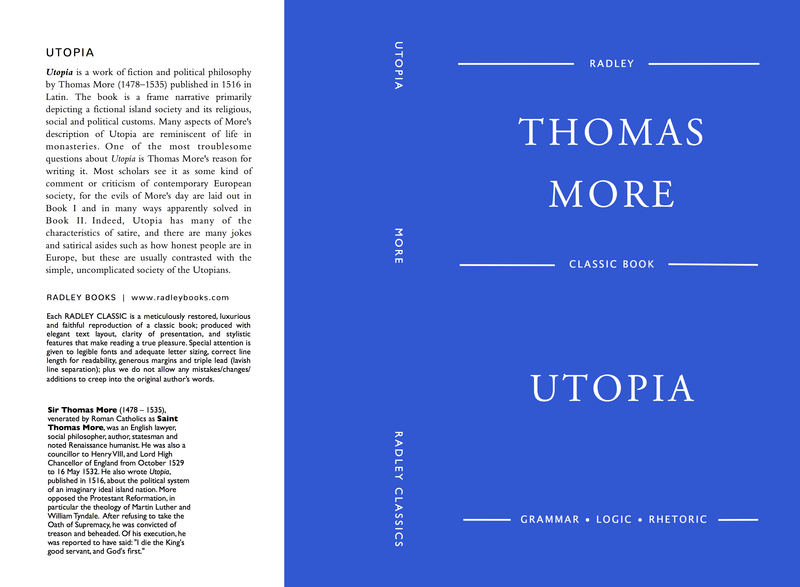 One of the most troublesome questions about Utopia is Thomas More’s reason for writing it. Most scholars see it as some kind of comment or criticism of contemporary European society, for the evils of More’s day are laid out in Book I and in many ways apparently solved in Book II. Indeed, Utopia has many of the characteristics of satire, and there are many jokes and satirical asides such as how honest people are in Europe, but these are usually contrasted with the simple, uncomplicated society of the Utopians. Purchase UTOPIA on Amazon here.